There was a sense of inevitability when Virgil van Dijk volleyed home a last-minute equaliser on Monday night. The Netherlands, a team slowly emerging from their own existential crisis, had already beaten Germany 3-0 earlier in the autumn and they were on hand once again on a chilly night in Gelsenkirchen to make sure their bitter rival’s annus horribilis came to an appropriately humble ending. It could have been quite different. Five minutes earlier Germany were gliding towards victory. A victory that would not have saved them from Nations League relegation, but one that would have been a flicker of light at the end of the dark, damp tunnel of 2018 – particularly thanks to the identity of the goalscorers Timo Werner and Leroy Sané, two torch bearers of the Die Mannschaft rebrand. But as the clocked ticked down and the crowd began shuffling in their cold, plastic blue seats, Van Dijk had other ideas. As the Liverpool defender’s shot flew past Manuel Neuer, arms were flung and heads dropped, but had they really expected anything else? The crowd hadn’t. Deflated and disillusioned, they had been flat throughout. The supporters, the players and Jogi Löw will be glad to see the back of 2018. It has been a mess, on and off the pitch. Germany never got going in 2018. A couple of prestige friendlies in March, in which they drew 1-1 with Spain and lost 1-0 to Brazil, were followed by two warm-up games immediately before the World Cup. Austria and Saudi Arabia looked like ideal opponents: not strong enough to push Germany too hard but not weak enough to make the matches meaningless. The idea was to give the world champions a couple of morale-boosting victories that would get them humming before they defended their title. It did not work out that way for Germany. The supporting cast fluffed their lines in a 2-1 defeat to Austria and then Löw’s first XI huffed and puffed to a narrow win against Saudi Arabia in Leverkusen – a game in which Ilkay Gundogan was booed by the home crowd after he and Mesut Özil had met with Turkish president Tayyip Erdogan. It was not quite the sendoff the squad expected. Still, this was Germany, the world champions who boasted a team that oozed with talent, experience and pedigree. A tournament team. For his part, Löw batted away any negativity, saying his side would be ready when it mattered. So on to Russia. Even after their 1-0 defeat to Mexico in their opening game, nobody could have really expected it to end as badly and quickly as it did. It is one thing to be caught flatfooted as you ease your way into the tournament, but this was different. Germany were wasteful, sluggish and rattled throughout. Something was off. Take two. Sweden. That’s more like it. Toni Kroos not only secured a vital three points, but also provided a potential springboard into the tournament – a chance for the team to get out of the group, dust themselves down and regroup. But with everything riding on the game against South Korea, Germany capitulated. And how. They were out, bottom of a group they were expected to win easily. As levels of schadenfreude around the world reached dizzying new heights, Germany was not amused. Löw’s tactics and selections were dissected and the depth of dissatisfaction sloshing around the squad began to splash over the sides. Rumblings of discontent in the squad had caused cracks and they had become chasms when Meszut Özil’s tweet dropped in July. Perception plays a huge part in football. Experienced veterans suddenly become past it, slow and inflexible. Mercurial and enigmatic forwards are flaky and inconsistent. Neuer, a forward-thinking keeper so often praised and revered for his sweeper-keeper qualities and calculated risk-taking, had become a loose cannon not to be trusted. With the sensationalism and exaggerated soul-searching that follows any tournament exit, it was hard to foresee anything other than Löw clearing his desk. He had made mistakes, no question. He had disregarded the success of the Confederations Cup winners of 2017 and turned back to his trusted old guard, regardless of fitness and form. If the Confederations Cup had been an audition, surely many had earned their recalls. Sandro Wagner, for one, was unimpressed at not being on the plane to Russia and announced his retirement from international football with immediate effect. But it was another absentee from Löw’s squad that raised more eyebrows. Being voted the best young player in the Premier League need not justify automatic selection – and the general consensus was that Sané was a different player in a City shirt – but his omission looked increasingly baffling with every failed attack in Russia. 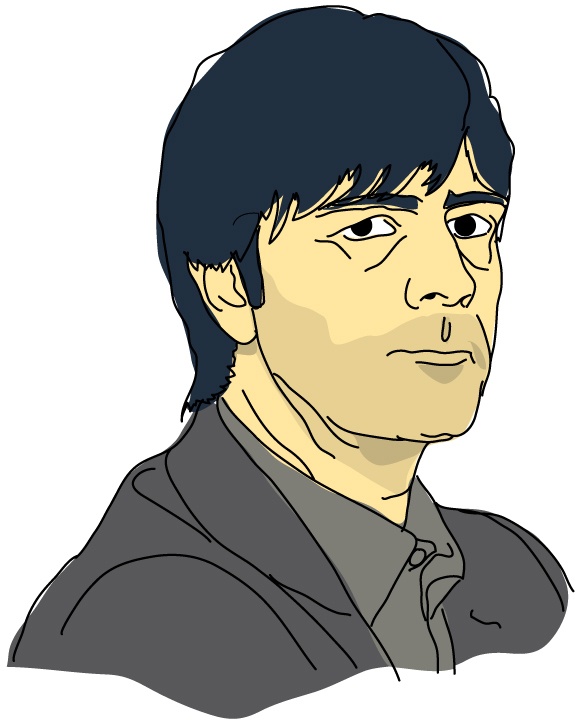 Somehow Löw came out the other side of the inquest with his job. In doing so, he had to admit his own failings and offer a way out of the mess he had helped create. The DFB and the public demanded not just improvements, but a complete rethink. Players would no longer be picked on reputation and fresh ideas were required. To be fair, Löw has obliged. Not only has he given more gametime to players such as Timo Werner, Serge Gnabry, Leon Goretzka, Thilo Kehrer, Kai Havertz and, of course, Sané. The manager has also made strides to adjust his tactics to suit them. The results remain poor but the performances have – at least in part – improved. A large section of Germany fans are still unhappy, but Löw’s new direction has gone some way to placating the critics and buying him time. He is setting out on the same road Southgate did a couple of years back and is trying to make a demographic shift the catalyst for enthusiasm, vigour and success in the national team. Southgate’s triumphs on the pitch and off it will give Löw and the DFB hope. So what next for Löw and Germany? Some big players have left the international scene and others are likely to be phased out in time. We can expect to see Löw popping up at Bundesliga stadiums up and down the country, casting his eye on some of the league’s younger players. He and his staff now have a break in which they can explore new routes to success. The Bundesliga is full of talented young players who are given time to shine – an advantage Löw has over Southgate. After the Netherlands game, Löw said that, as much as he suffered after the disappointments in Russia, he had found the aftermath of the success in Brazil far harder to process. It makes sense. How do you follow a World Cup win? The sensible thing to do would be to ride off into the sunset a hero and legend. Carry on and you’re probably on a hiding to nothing. The same goes for the players as well as the manager. No matter how poorly 2018 has been for Löw, you have to give him credit for not taking the easy option. Not in 2014 and not now. The one positive Löw can take from 2018 is that he is still has the opportunity to turn it around. He has the players and the backing of the DFB. But perhaps more importantly, he once again should have the bit between his teeth and Euro 2020 firmly in his sights. The questions is: will he make it out of the tunnel to see light shining again? Previous End of an era?